This ambitious volume brings together a group of distinguished scholars who have worked together over five years’ time in an attempt to explain the present pan-Asian revival of Confucianism a century after it was declared moribund by leading philosophers and thinkers in China and Japan as well as in the West. 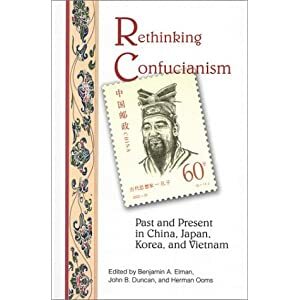 This collaborative study of China and its historical sphere of influence in Japan, Korea, and Vietnam begins by clearly establishing the principal threads that made up Confucian thought in the period of its unchallenged eminence. It also examines the pitfalls of Western scholars who have tended to lump together as "Confucianism" many diverse currents of Chinese and other Asian classical thought. Uniquely, the book explores as well traditional Confucian views of issues such as gender, medicine, and ritual, and examines the reasons given by leading Asian and Western scholars for rejecting Confucianism at the end of the nineteenth century. Benjamin A. Elman is professor of history at the University of California, Los Angeles. He earned his Ph.D. in Oriental Studies at the University of Pennsylvania, 1980. He was a Peace Corps volunteer in Thailand, 1968-71, and was director of UCLA’s Center for Chinese Studies, 1997–99. His other works include Classicism, Politics, and Kinship: The Ch’ang-chou School of New Text Confucianism in Late Imperial China (University of California Press, 1990); A Cultural History of Civil Examinations in Late Imperial China (University of California Press, 2000); and From Philosophy to Philology: Intellectual and Social Aspects of Change in Late Imperial China (UCLA Asian Pacific Monograph Series, 2001). John B. Duncan is associate professor of East Asian Languages and Cultures at UCLA. He received his Ph.D. from the University of Hawaii, 1988. He is the author of The Origins of the Chosýn Dynasty (University of Washington Press, 2000) and has published articles in both English and Korean in such publications as The Cambridge History of Korea, the Journal of Korean Studies, Acto Koreana, and Korean Studies.